Global and domestic growth continues to run above our long-run forecasts. A wide range of data suggests the global economy is performing well. For example, last week the European Central Bank raised their 2017 Euro-area growth forecast to 2.2%, the fastest pace since 2007. Meanwhile, the Federal Reserve Bank of Atlanta’s “GDP Now” model is tracking third quarter domestic growth near 3%. Japan is even growing at a healthy 2.5% pace, and China just reported a 7% rise in imports suggesting strong internal demand. In short, the global economy is performing a bit better than the 2.8% domestic and 3% for global growth rates we originally expected at the start of the year. Despite the better performance, there remains an absence of inflation pressure (U.S. core inflation up just 1.4% year-over-year), giving central banks room to run accommodative policies longer. Tighter labor markets are not yet delivering the cost-push inflation that the Philips curve might otherwise suggest, and some at the Federal Reserve are beginning to question the efficacy of the model itself in foreshadowing inflation (see last week’s speech from Governor Lael Brainard). 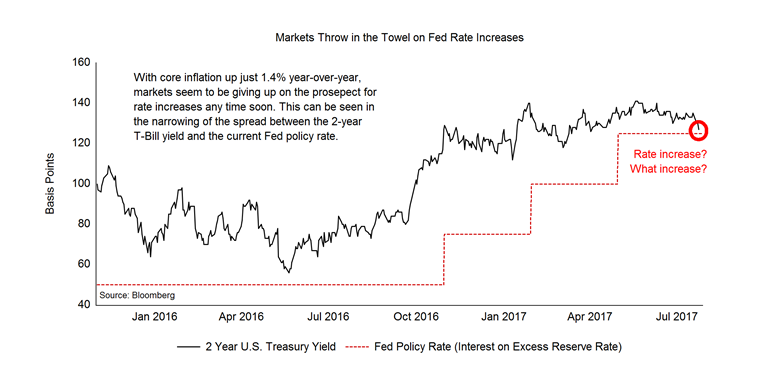 In our January 2017 Outlook, we claimed that it would be hard for the Fed to follow through on planned rate increases because of the slack created as the result of ongoing deleveraging. The impact this would be lower cash returns than the market had been pricing in. The fading of rate increases this year turned out to be consistent with this view and contributed to a flattening of the yield curve and weaker dollar. The chart below shows the extent to which expectations for rate hikes have collapsed. The yield on two year U.S. Treasury bills versus the current policy rate (known as interest on excess reserves, or IOER) are nearly the same. This implies a negligible expectation for rate hikes over the next couple of years. Unless the economy unexpectedly stumbles, it seems to us more likely that the pendulum has swung the other way with the market now underestimating the likelihood of future tightening hikes, in our view. As markets digest the impact of recent hurricanes in the United States, and with some temporary agreement on the debt ceiling, investors may remain focused on the underlying good news. We see the “bull case” resting on three pillars: 1) above trend growth expectations; 2) expectations for dovish central bank action; and 3) prospects for higher earnings. Risk premiums appear fairly low in equity and credit markets, suggesting that disappointment in any one of these areas may boost volatility. This, coupled with our take on fundamental conditions, leads us to adopt more of a risk-neutral posture than we had earlier this year. We also note that recent trends in the dollar could change now that markets have adjusted to a lower-for-longer rate expectation. While we remain overweight developed markets (which have benefited from the weaker dollar), we could envision a fading of downward pressure on the dollar from here. In this case, expected excess returns for foreign markets would be relatively less attractive versus domestic equities.